Christopher Clarkson and Jacques Brejoux are teaching their renown cover paper workshop at the Moulin Du Verger Paper Mill in France, September 11- 18th, 2010. Chris is an amazing, inspiring teacher. Not only have I learned an immense amount from him about the history and techniques of book conservation, but he has perhaps, more than anyone else, informed how I understand and teach the history of bookbinding and conservation. 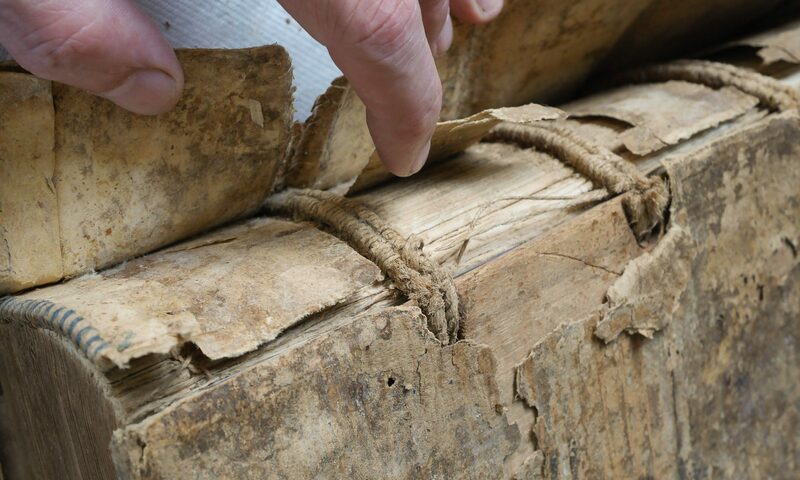 Preamble: As book conservators we find ourselves in a tragic situation; the most common covering materials we use, leather & bookcloth cannot be guaranteed longer than 30 to 50 years. An actual period text-block may have taken several 100’s of hours to treat, with the 100s of thousands of period books requiring attention, where is the sense in using such short life materials, it is like running backwards. This project is obviously not about replacing leather & bookcloth with paper, but where a cover paper is appropriate we need to understand the qualities & techniques required for it to last many generations. After the Florence flood of November 1966 I noticed how well the limp & semi-limp paper & vellum covered book structures of the Magliabechiana Collection stored in two basement floors of the Biblioteca Nazionale Centrale di Firenze (BNCF) had survived, compared to stiff board bindings. They had been under water, mud, oil & sewerage for ca. ten days before being sent to tobacco kilns for quick drying. Historically the early limp or semi-limp binding structures use no adhesive in their construction but rely on the quality of cover material & of stitching or tacketing techniques. The qualities required in the cover material are therefore more those where there is a stiff-board core – mouldability, hinging strength & abrasive resistance. Also required are tear & crease strength, fold moulding – not only of smoothness but also girder-like folds, designed for structural support. The consideration of weight to format & rigidity without loss of a certain flexing are also important. All such factors play their part in the success & tactile enjoyment of such bindings. These early cover papers are full of character, strength & durability. My wish to develop similar rebinding styles for treated & repaired text-blocks in Florence in 1967– 9 was thwarted by not being able to find any hand papermakers to replicate the durability & toughness of the early Italian Renaissance cover papers. All samples produced were similar to heavy artist watercolour papers; with few of the qualities I was seeing & feeling in the Renaissance cover papers. When I moved to America in 1972 I discussed the need for quality cover paper with the Twinrockers papermakers, & showed them some examples of Venetian & Florentine early 16th century examples in the Library of Congress, & talked of my need for such a similar cover paper. Although we have been friends ever since & I purchased many papers for other purposes, such a replicate quality cover paper was never produced. It was not until Tim Barrett returned from Japan that I found an enthusiastic person who took on the challenge. Over the years although Tim was unable to obtain a cover paper of sufficient quality & character that suited 16th – 18th century text-blocks, he has produced a variety of cover papers that I have used on 19th & 20th century items. It was at the IPC, Edinburgh Conference, 2006 that Stuart Welch introduced me to Jacques Brejoux of Moulin du Verger, by saying “meet Chris he has been trying to get cover papers similar to 1500’s quality for many years”. Jacques & I got on well together, but I found it difficult, without examples of Renaissance books, to explain to Jacques what was required. Stuart then suggested that we should run a workshop together & he knew of certain senior conservators who would be interested. The workshop was set for September 2007 in Jacques mill in Angouleme, France, its aim being an attempt to produce a cover paper similar to those of the Venetian/Florentine Renaissance. Jacques as well as the participants became enthusiastic about the 16th & 17th century limp paper bindings I had brought as exemplars & experiments & ideas flowed. As we continued with testing & binding various cover papers the qualities we were after became better understood. It was during this workshop that Jacques became aware that he needed to prepare pulp with stampers, rather than a Hollander. Word about our efforts at the mill had got round & the workshop was repeated in September 2008. By this time Jacques had designed & built a set of stampers, so direct comparisons could be made between pulp produced using the Hollander & that produced using the stampers. I had also been able to get funding to bring Silvia Pugliese over with many Venetian 16th & 17th century paper covers from Biblioteca Marciana; Jacques was in heaven. In studying the Venetian cover papers Jacques thought that many appeared to be a multi layered couched paper, couched ‘in-line or some possibly ‘cross-couched’; some appeared to be pressed & hand glazed. Although they do not have the appearance of pasteboard, where a corner is worn & dog-eared, some of them certainly display a layered material. 3rd workshop in 2009; it was extraordinary to arrive in Jacques’ valley to hear the thumping echo of a set of stampers preparing linen pulp, a sound which would have been common in the medieval past. This was the first workshop in which the stampers were in full swing & some of the couched linen papers produced at this workshop, & later by Jacques, are remarkably similar to the Venetian cover papers we had handled the year before. It was after this workshop that brush-sizing experiments took place, in which it was noted that ca. 10% of certain multi couched papers had areas of their outer layers delaminating. This lead to speculation, whether historically a gelatine or starch ‘binder’ could have been used between each couched sheet. This caused Jacques to re-look at Lalande’s reference to starch being used, although his reference is to the production of playing cards, which suggests pasteboard-making by a binder or other professional, using dry sheets. Lalande describes three or four different types; at least one type could be describing multi couching in a paper-mill. A reliable source of linen rag is crucial to the production of this cover paper; Jacques has been building up a stock for many years. Only having a few published sources to hand, Jacques & I were wondering if any one knows of other archival sources, especially pre-Lalande, describing multi layered, possibly couched, heavyweight paper. Although I have no background in such archival research I did offer to send this e-mail to anyone who may be able to suggest other 18th century, or earlier sources. i This is difficult as test equipment is designed for the modern paper industry & not for cover papers of the quality we are producing. ii This describes a test that I designed to duplicate a fore-edge lacing, I have used it since our second workshop in 2008.